Here are a collection of information about the Tanzer 22 sailboat. I welcome additions. Tanzer Boat Parts original parts. Shop is near Montreal, Quebec, Canada. They Ship. 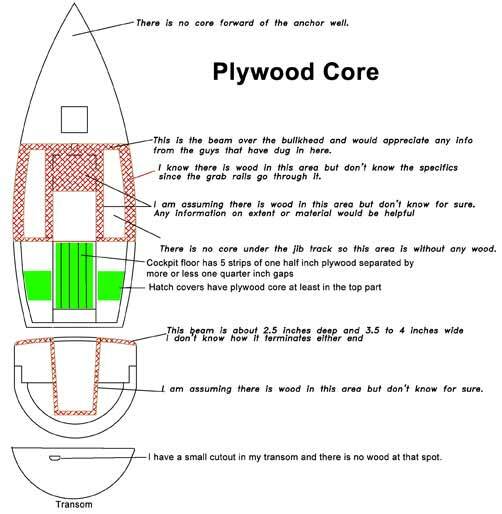 Diagram of where there is wood in the core. I can speak for the accuracy of the green which is my contribution. Someone from the Tanzer Yahoo forum put in the red. If you know of cored areas please email me and let me know. I think there is probably some in front of the hatch but I don't know where exactly. My guess is that the flat areas are a good bet. There is wood around the portholes/windows. I've included this but warn that other than the green parts this is not verified information. Micheael Goudeseune's Tanzer22 web page. Good read. He's done a number of maintenance projects including replacing the bulkhead/chainplates, and fixing the cockpit locker doors. He also has a quite elaborate electrical plan. 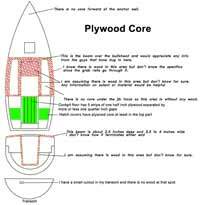 A good boating maintenance resource. Tanzer 22 sales brochure PDF file has dimensions and other useful info. I Replace the Damaged bulkheads and chainplates.